Play video What do you do when you've won everything? from BBC SportWhat do you do when you've won everything? M6 Staffordshire southbound severe accident, between J14 for A34 and J13 for A449. M6 Staffordshire - One lane closed and heavy traffic on M6 southbound between J14, A34 (Stafford North) and J13, A449 (Stafford South), because of an accident. More than 30 police officers from around the UK are passing through the area today, on a 180-mile (290km) cycle ride in remembrance of colleagues who have lost their lives in the line of duty. The Police Unity Tour will be passing through Herefordshire, Shropshire, Staffordshire, Warwickshire and Worcestershire over the next two days, finishing at the National Memorial Arboretum at Alrewas. Deputy Chief Constable Amanda Blakeman (pictured above right) from West Mercia Police is among them and she said she was taking part to remember PC Richard Gray who was shot dead in Shrewsbury in 2007, while trying to arrest a gunman who was holding two fellow officers hostage. An "intense" pre-season fitness programme for players will "pay dividends" once games get under way, according to Crewe Alexandra manager David Artell. He says he wanted to give them a good platform of fitness to "make sure we can last the whole season". People will say they are young lads and they should be fit but they have to be ready to play 50 plus games and make sure they can produce in on a Saturday, then a Tuesday and the Saturday again. It is tough and we have given them a good basis of fitness." M6 Cheshire northbound severe disruption, between J16 for A500 Crewe and J17 for A534 Sandbach. M6 Cheshire - One lane blocked and slow traffic on M6 northbound between J16, A500 (Crewe) and J17, A534 (Sandbach), because of a broken down car. In the roadworks area. 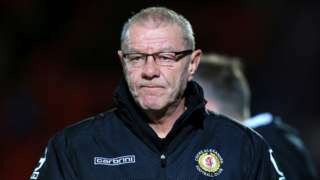 Neil Baker, Crewe Alexandra's head of recruitment, is to return to manage his former club Leek Town 23 years after leaving. A review is being carried out into whether the murder of a two-year-old girl by her mother in Stoke-on-Trent could have been prevented. Macy Hogan was suffocated by her mother Cody-Anne Jackson at her house in Fenton last year. She's now been given a life sentence with a minimum of 16 years. Det Insp Dan Ison, from Staffordshire Police, said the review involves several different agencies, but it would be inappropriate to comment at this stage. After a bright start cloud will start to increase with outbreaks of showery rain expected this afternoon. A breezy day with top temperatures of around 20C (68F). M6 Cheshire southbound severe accident, between J18 for A54 Middlewich and J17 for A534 Sandbach. M6 Cheshire - One lane blocked and heavy traffic on M6 southbound between J18, A54 (Middlewich) and J17, A534 (Sandbach), because of an accident involving two vans. M6 Cheshire - One lane blocked on M6 northbound between J16, A500 (Crewe) and J17, A534 (Sandbach), because of a broken down van. Traffic is coping well. In the roadworks area. M6 Staffordshire - One lane closed on M6 northbound between J12, A5 (Gailey) and J13, A449 (Stafford South), because of a broken down vehicle. Traffic is coping well. We'll be back with our usual mix of news, sport, travel and weather from 08:00 tomorrow, but keep an eye out here for more updates this evening and into the morning. Police say they have CCTV footage of thieves stealing a large quantity of equipment from a building site in Newport over the weekend. They say it shows the intruders breaking into the rear of the Victoria Hotel on St Marys Street and a white pick-up truck, a white van and a flat bed lorry then driving off along Water Lane. Staffordshire digger maker JCB says it has agreed one of its biggest ever orders in the UK, worth around £55m. The firm says hire company A-Plant wants more than 1,200 machines, plus more than 160 generators, which are made in Hixon. Most places should become largely dry with clear spells overnight, with perhaps the odd shower around. It will be a breezy night - lows of 13C (55F). Video caption: Weather for the West Midlands.Weather for the West Midlands. In a statement read out in court, Macey Hogan's father Paul said he missed his daughter every day and a big piece of his heart went with her the day that she was killed. Her mother Cody-Anne Jackson has been jailed for life and told she would serve at least 16 years for her "wicked and appalling" crime. A Wolverhampton man has appeared in court, charged with dangerous driving and attempting to cause grievous bodily harm to a police officer, following a chase on the A51 at Bridgemere. The 35-year-old was remanded in custody and is due to appear before Chester Crown Court on 24 August. M6 Cheshire - Very slow traffic on M6 northbound between J16, A500 (Crewe) and J17, A534 (Sandbach), because of an earlier broken down vehicle. All lanes have been re-opened. A safeguarding review is typically carried out after the death of a child. It's purpose it so see if it could have been prevented and what lessons can be learnt, if any. In some notable past cases they have been highly critical of various agencies. In the case of Macey Hogan, however, it's so far unclear if there was any contact at all with the family before Jackson's fateful 999 call. Such reviews often take months to compile, depending on the amount of evidence. So far, we have no timeline for the review into Macey's death. A review is being carried out to see if there were any opportunities to spot the danger Macey Hogan was in and prevent her death. The investigation involves several agencies. The case was "unusual and very rare" said Det Insp Dan Ison, "something that I've never come across before". "As the judge commented", Det Insp Ison said, "when the mother takes the life of a child there's usually some kind of mental health issues associated with it - that is not the case here". "The police are engaged in the review, so we will see if anything comes out of it." The formidable under-11s Leek Town Strikers are hoping to persuade more girls to join the sport.